Obviously, I was taking a risk here with Trader Joe's Matar Paneer. I've braved both frozen and boxed Indian food from Trader Joe's, with more success than not. But look...it doesn't matter how cool and printy and no labelly and kinda retro the can looks, it's still a can. A can. Conveniently with a pop-top tab, I may add, so in the history of cans, this can is up there...but, still, a metal, shelf stable can, prone to dents and questionable-by-association contents. But that's not even all. If you can't tell by the photobombs by Optimus Prime and a cheapie USB plug fan from Target, this was my work lunch one day this past week. 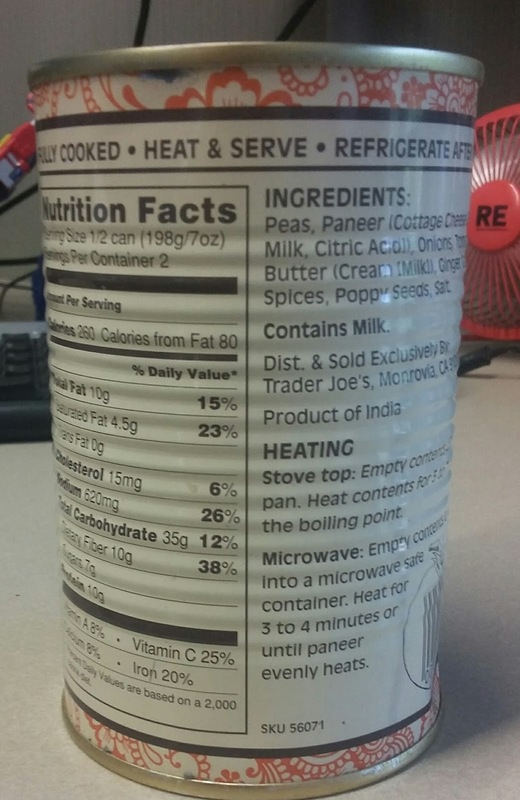 So not only did I have to open a can of Indian food, I would then have to heat it in the microwave. I don't mean this in any sort of rude way, but I didn't want to be lumped with the guy who zapped some fish (never, ever do that at work) or the nice lady who scorched her popcorn. I didn't want anything to smell too curry-ous if you know what I mean. And then I would have eat it, and again, not to be rude, but deal with any potential, umm, after-effects while on the clock. I do enough on my own every day the toes the HR-visit line, did we really need to tempt it? I did. And happy to report, the matar paneer passed every test. Rather impressively, I may add. After just a couple minutes and a stir or two from the break room nuker, lunch was served. The aroma was surprisingly mildly fragrant - definitely some warmth with spices, but my cubicle neighbor's chicken fingers made its presence known more than my bowlful of Indian. Got a few compliments from those closest to me but that was it. Visually, the curry appeared soupier than it actually was - the peas and onions thickened up the tomato base more than expected, without seeming too swampy. With a little rice mixed in after a couple bites, the feel and consistency was just right. And taste...my goodness. 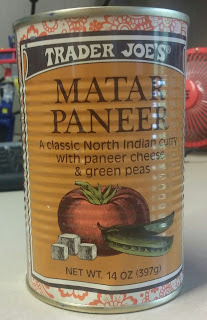 Is it authentic matar paneer tase? Look: ¯\_(ツ)_/¯. I don't know. But purely on it's own basis, it's delicious. Plenty of the usual Indian spices - enough heat to help clear the sinuses a little, with a pleasant linger, but easy enough to cover up with a stick or two of gum afterwards. 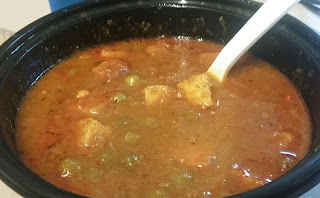 If you've had the paneer in other TJ's dishes, this is fairly like the others - softly firm, mild, a welcome bite, and there's plenty of it. I'd say it's dang near perfect for a work lunch mix up from the norm - cheap (was it even $2? ), easy (dump, zap, eat), quick, delicious. Just make sure you don't have an important meeting afterwards, and watch out for dribbling on the TPS reports. I'm going solo on this - Sandy wasn't entirely willing to take the risk until she saw how I fared - but sometimes with high risk, comes high reward. This is one of those times. Sonia and I just had this too. We loved it. The jarred stuff they have isn't nearly the same as the frozen tikka masala sauce. I second this suggestion! I'll 3rd the request for the frozen tikka masala sauce - it's wonderful. better than any of the bottled ones. Please, TJ's! I really enjoyed this Matar Paneer as well. The flavor was great. My only quibble with it is, I wish there were more cubes of paneer (I counted 5 in my can) and the cubes themselves were a little mushy. I know it can't be as good as fresh paneer, but I wish the cubes held up better in the curry! I didn't count my paneer but I definitely had more than that! We got both of the canned Indian food offerings, and they were both impressively yummy. I was sad to not see them the last 2 times I visited TJ's. I hope this isn't a line that ends up being discontinued because I'd planned to stock up. Yay! I just bought this on my last TJ's haul. There's never enough paneer in panner dishes, so glad to hear I should be less disappointed by this. I've tried all three of the new TJ canned Indian food entrees. And they are all great. The shelf-stable silver envelope entrees are all very good (I'll happily have any one of them as a meal), but I rank the canned ones just a bit better all around. I'm having it right now and I find it terribly bland. Both in terms of aromatics, as well as heat. I usually get the Indian meals in the metal foil version from Indian supermarkets, and they are much more flavorful. Blech. I just tried this and was looking around for validation on my feelings, but I haven't found any to my surprise! I thought it was way to salty and acidic, which made it hard to taste any of the spices while eating it. There was, however, plenty of paneer and it was nice and firm. 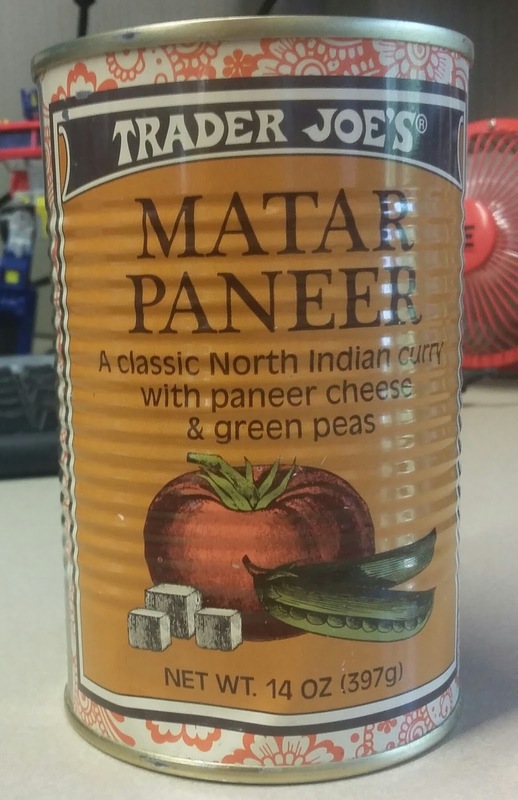 I just opened a can of the TJ Matar Paneer and very sour and triple checked the date "Best Before MAR 2018". Not a fan of this one. 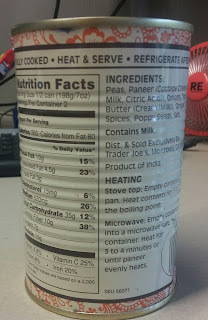 I hope the can of TJ Dal Makhani is better. The frozen TJ Indian Fare tastes good, so very disappointed. Wish they still sold this at TJ's! Anyone find this brand elsewhere?